You may have already sailed the Jackdaw over every inch of the Caribbean, but that doesn’t mean you’ve seen everything that Assassin’s Creed IV: Black Flag has to offer. AC IV’s first story-based DLC hits next week, so we invited Ubisoft Community Developer Gabe Graziani over to tell us what to expect. 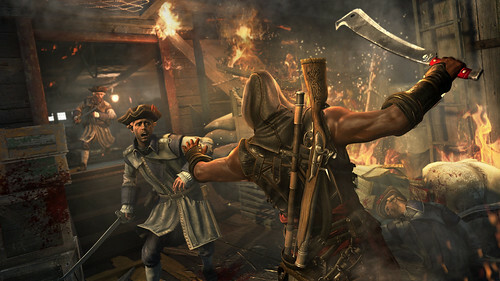 Your adventures in Assassin’s Creed IV Black Flag continue in our newest downloadable episode Freedom Cry! Playing as Edward’s first mate, Adéwalé, fifteen years after the events of Black Flag, you’ll journey beyond the original story and discover what the future holds for this brutal Assassin. It’s been decades since Adéwalé earned his freedom from slavery through raw violence, but his hopes of escaping the foul business of human trafficking are dashed when he finds himself embroiled in conflict. Faced with a situation in Port Au Prince, Haiti that he can neither abide nor ignore, Adéwalé must confront his past and fight to liberate the slaves confined there and in Saint-Domingue, Jamaica and Cuba. Driven by righteous rage, Adéwalé rates among the most brutal Assassins ever. With the strength of Connor and the finesse of Ezio, Adéwalé uses a ruthless set of weapons, including an iconic machete, a booming blunderbuss, a veritable hand cannon, and a prescient of modern shotguns that can deliver a lethal blast in a broad cone capable of neutralizing multiple enemies. Brand new mechanics govern Adéwalé’s system of upgrades and equipment, rewarding you for freeing slaves throughout the West Indies and surrounding open ocean. Not only will you gain access to more lethal weapons and tools, but also new upgrades for Adéwalé’s ship: the Experto Crede! Hunt down and destroy ships escorting massive slave galleons to rescue hundreds of slaves and paralyze the slave economy. They will rise up and for years to come, the world will remember the cry for freedom! Best begin soon, there is much to do Assassins! Freedom Cry is coming to Xbox One and Xbox 360 on December 17th.